Quality Kitchen Knives: What Makes Quality? You’ve undoubtedly heard the saying about the importance of having “the right tool for the job.” When you’re doing work around the house, you’d hardly use a hammer when you need to make a two-by-four shorter. When working in the kitchen, the concept is absolutely the same. Yes, you’ll need to start with the right ingredients, but the tools you use can have just as much impact on how a dish turns out. Of course, there’s always room for creative workarounds when you don’t own an entire kitchen supply store, but any trained chef can tell you the one place you should never skimp on is your knives. Quality kitchen knives can make the difference between easy preparation and cooking and a trip to the E.R. But what actually makes a kitchen knife quality versus a lackluster imitation? A big part of factoring in quality will depend on what you intend to use the knife for. If you have the budget for a full knife set, you’ll want a range of different lengths to make different tasks easier. 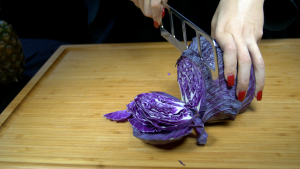 For example, a chef’s knife is best for dicing an onion or chopping vegetables and a serrated knife is better for slicing things like bread or tomatoes, while a carving knife is made for—yep, you guessed it—carving a chicken or cutting a roast. However, if you don’t have the budget to buy a full set of knives all at once, you’ll probably be better off investing in one quality knife instead of buying a less-costly and lower quality set. A well-made knife can last for decades with the right care, whereas a lower-quality set will lose their edges and wear away much faster, leaving you to replace the set in just a few years. A chef’s knife is a good size and length to be good for most uses, so start there. No, we aren’t talking about a barbeque sauce with a good amount of vinegar or spice. In knife terms, the tang refers to how far back into the handle the metal from the blade extends. This is usually a good starting point to determine whether a knife is decent quality or not. A quality knife will have a full tang, meaning the metal of the blade extends the full length of the handle. Usually, it can be seen as a contrasting metal line that goes all the way back into the handle. A knife with full tang will have better balance, making it easier to use comfortably. In addition, a knife with full tang tells you the blade was made from one piece of metal, rather than multiple pieces joined together, so you can trust that it will be more durable. Whether you’re buying one knife or a dozen, the idea is that you’ll be using them frequently. Is the handle something easy to grip? Are there dips or grooves to make it more comfortable? But you’ll also want to consider the handle’s material. A wooden handle has the potential to peel and crack if the seal doesn’t hold, so a plastic or resin handle is usually more durable. There are two different features you’ll want to look for when it comes to the knife’s cutting edge: the length and the curvature. The edge itself should be a smooth, continuous edge, even on serrated knives. Any small nicks or pitting will tell you that the metal used is not high quality and is easily damaged. While you’re inspecting the edge, check out how far it extends. A lower quality knife will often have the sharpened edge stop an inch or so before the actual end of the blade. This can be problematic in particular for when you need to chop thicker and denser foods like carrots because, often, that last inch or two of the knife is where you’ll get the best leverage. If the edge doesn’t extend the full length of the blade, you miss out on that valuable cutting space. In addition to how far the sharpened edge extends, the shape also matters—but for the most part, is more a function of your personal preference rather than a marker of quality. Some blades are made with a flat, straight edge while others have a slight curve to them. Generally speaking, a knife with a slightly curved blade will be easier for most people to use. The slight curve is there to let you rock the knife back and forth without fully lifting it from the cutting board, as opposed to lifting and shifting it for each chop or slice. The curved edge can help minimize kitchen accidents because it makes the knife easier to use. At Easy Slice, we’ve looked at all the components that go into quality kitchen knives and used that information to create our specially designed knife options. Easy Slice knives are all full-tang for better balance and have a no-slip golf ball grip to minimize cutting accidents. We also give our knives a double-edged scallop, which means our knives can both chop and slice with ease—that’s why we’re called Easy Slice! Our blades are rated to a 57 Rockwell hardness, which means our knives will retain their sharp edge with no need for sharpening or honing. In addition to the double-scallop edge, our knives have cut-outs in the blade. No, it’s not because our knives are low quality; it’s to make our knives no-stick knives. Those holes in the blade help prevent it from sticking, even when slicing through something large and thick like a squash or a watermelon. 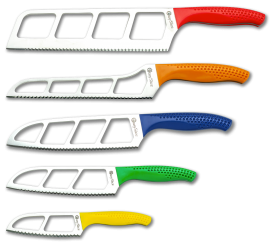 Whether you’re looking for a utility chef’s knife or a full set of quality kitchen knives, Easy Slice has the best options for the home cook. Experience the difference an Easy Slice knife can make in your cooking ventures. 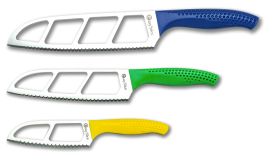 Grab a set of our quality kitchen knives or shop individually online!